Will Run for Cheeseburgers: Great Harvest Bread Co. The weather is absolutely beautiful today in Charlotte. For once this month the temperatures haven't hit the 80's or 90's and have stayed somewhere in the high 70's. It's even breezy out! It made the walking to and from work enjoyable so far. I'm even looking forward to running 5 miles later today ... seriously. For lunch Ryan was kind enough to run some errands with me. We picked up my car from getting an oil change and then headed to Target and Trader Joe's. Once we were done with some minimal shopping it was off to the Great Harvest Bread Co. for some sandwiches. This was my 2nd time stopping by their delightful establishment and I was unoriginal and ordered the same thing as before. 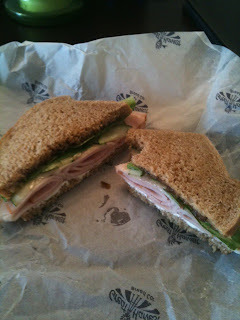 I went with the Smoky Mountain - Smoked turkey, cream cheese, raspberry hot pepper jelly, lettuce, cucumber. Ryan chose the The Greenway - Choice of smoked turkey or roast beef, Swiss cheese, pesto mayo, lettuce, tomato, red onion (he said no onions and asked for roast beef but got turkey instead). Another delicious sandwich. Love coming here for some quick lunch. Sad that they are closed on Mondays ... Ryan and I found this out the hard way last week. Here's hoping the sandwich gives me enough fuel tonight to power through those miles.